Teenage Arab provocateur Ahed Tamimi, who recently served eight months in prison after she was filmed slapping and kicking an IDF soldier, called on all Arabs to follow her lead slap Israeli soldiers. Tamimi was interviewed on a radio show in Tunisia and said, "The world should not panic or be appalled by a Palestinian who slaps an IDF soldier. Everyone should do it, not just me." "They have captured our land, they shoot small children and point their weapons at houses and people," she said. She claimed that harming soldiers "is a natural response to the presence of the occupation, to the presence of occupying soldiers on my land, all of them have to contradict the soldiers." 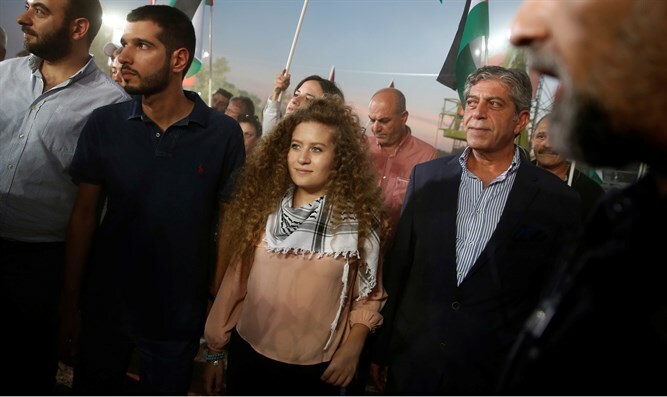 When asked about the next step in her struggle against Israel, Tamimi said, "I vowed to continue the path of the martyrs, so that their blood will not be spilled for nothing." "Jerusalem was and will remain the eternal capital of Palestine, I left prison and left behind 29 female prisoners in the Sharon prison, including the administrative prisoner Khalida Jarrar. The message of the prisoners who I left behind was to demand the unity of the people and to support prisoners and prisoners for their rights and freedom," she said.